Actuality there are actually two B movies in one here: A pretty taught little SNEAKERS/WARGAMES ripoff about a nuclear war triggered by “accident” after Lybians hijack a shipment of cruise missiles and shoot one into Russia. It doesn’t detonate but manages to push east/west tensions to the breaking point, the Russians nuke America and the Americans retaliate. Instant global apocalypse, and a demonstration of one of the prevailing nightmares of the Cold War. This sequence of events is ingeniously staged by having the three person crew of a secret orbiting weapons platform observe the exchange and agonize over how to react. Should they launch? Should they go back to earth? Eventually their satellite’s computer is hijacked by an unseen entity who prompts an impromptu landing somewhere near the coast of Canada, sparking the second of the two B movie scenarios that becomes a post apocalyptic thriller centered around a makeshift totalitarian regime dominated by the prep school brat of an Army general who recruits other brats, arms them with machine guns, and herds the surviving populace into a ramshackle town comprised mostly of junk. One of the astronauts encounters a survivalist hilariously played over the top by veteran character actor Maury Chaykin, who steals all of his scenes with a blase attitude (“Just get in your rocket ship and fly off to Central America.”), his home made converted front end loader tank contraption, and a kilt. He also has a teenage schoolgirl boarded up in his basement, the less said about which the better. His character is the only one in the film who emerges as an actual person, and when the story shifts it’s emphasis away from his fate it looses that central core of interest. 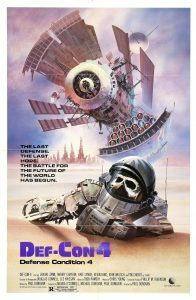 In any event the astronaut strikes up a deal with the survivalist for the space capsule’s food supply and the female astronaut still on board, leading to their capture by the renegades and a series of bizarre scenes of social chaos that seem to have been inspired by Spaghetti Westerns. I will admit that the film is a bit of a mish-mash, and hard to keep track of because it changes gears so quickly. At one minute it’s a high tech space thriller, the next a grim survivalist tale, then social satire and finally a big, stupid shootout. But in all fairness it’s only the final twenty minutes or so that loose their footing in absurdity, with the main detraction being the role of the Army brat dictator kid, who’s grip on the surviving populace is never fully explained. Why are the others following his lead? Since nobody bothers to tell the audience, the kid remains a caricature rather than a character, and the final conflict between the astronaut and him remains something of a contrivance rather than a believable series of events. The ending is also annoyingly empty of any kind of meaning at all, with the movie more or less simply being over at some point. You know, whatever. But if anything the movie has actually gotten more poignant over the decades since it’s creation: We now live in a world where middle eastern fanatics do indeed shape global events & have shown themselves capable of inflicting apocalyptic events. We’ve also seen events like the aftermath of Hurricane Katrina where social order has completely broken down, resulting in the kind of mind boggling escapades depicted in the latter part of the film. It’s no longer just an escapist nightmare/fantasy to suggest that what is being depicted in the film might actually happen, and the filmmakers should indeed be congratulated for pretty much getting the look of the apocalypse right … though I do think that people would have found more opportunities to wash their faces & would think that ammunition for firearms would be a bit more of a rarity. The long and short of it is that DEF-CON 4 is not the unwatchable disaster that many might have potential viewers believe. It’s a grim, grimy, somewhat distasteful endeavor for sure, but then again so was the prospect nuclear combat toe to toe with the Ruskies. Don’t knock the film for having more or less gotten the aspect of what that might mean correctly.